When your mood is soft and mushy, changing from day to day. While talking with a friend about the ballistics I was achieving with a super-charged 45ACP load he suggested I take a look at 10mm loads. Searching the literature for 10mm will tell you it's the parent of the 40S&W after being deemed "too powerful". The 10mm round is interesting in that case capacity is similar to that of the 45ACP but the bullet diameter is smaller (0.400" vs. 0.452"). Consequently, one should be able to build loads with lighter bullets pushed to higher velocities than what one could normally do with 45ACP loads. 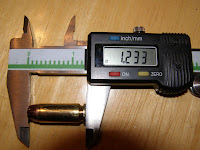 For example, it would be difficult to build a 45ACP load around a bullet lighter than 185gr. 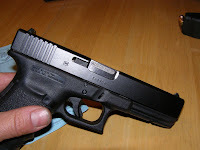 Now, the availability of new 10mm handguns here in CA is limited, due to the "approved handgun list"; essentially, one is limited to a Glock 20 or 29, and a Kimber Eclipse Custom II or Stainless Target II. But, assuming one already has a handgun chambered in 45ACP and one doesn't wish to invest in another handgun just to experiment with 40 calibre bullets, the 400 Corbon round comes to the rescue. The 400 Corbon is a now defunct wildcard round. 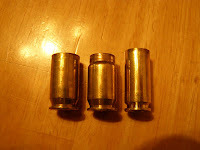 The round uses 0.400" diameter bullets in a necked down 45ACP case. 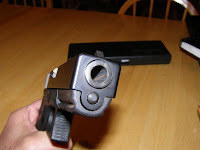 The advantage of a 400 Corbon round over a 10mm round is that with only a barrel change, an existing handgun chambered for 45ACP can be used. 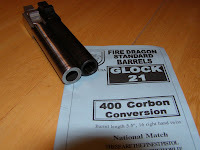 My first experiment with the 400 Corbon was with my existing Glock 21. 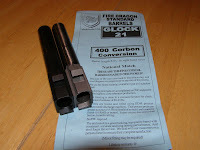 I ordered a 400 Corbon barrel from EFK Firedragon. The barrel dropped in with only one minor modification. The Firedragon barrel was a tad too thick in the barrel bushing area and hence the slide would not lock into battery completely. However, about 10 minutes with 200 grit sandpaper to the first 1" of the barrel from the muzzle, fixed that problem right up. 400 Corbon brass can be made by running 45ACP cases through a 400 Corbon full-length resizing die (and trimming to the correct length, of course). 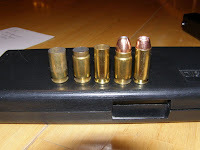 Here, from left to right, is a 45ACP case, a 400 Corbon case and a 10mm case. 10mm -- 0.400" Speer 155gr JHP GoldDot bullets atop Alliant Power Pistol powder; weight varied from 8.0gr to 10.1gr in 0.3gr increments. 400 Corbon -- 0.400" Hornady 155gr XTP/HP atop Alliant Power Pistol powder; weight varied from 8.0gr to 10.7gr in 0.3gr increments. Load data for the 400 Corbon is not readily available, so I was being conservative on the upper powder limit. However, since the 400 Corbon case has a greater capacity than the 10mm case (25.0gr of water weight for the 400 Corbon as compared to 23.7gr of water weight for the 10mm) I felt safe to use a greater upper powder limit for the 400 Corbon than the 10mm. Both sets were built to the same OAL; 1.230". The above two sequences where then shot through a Chrony and the velocities plotted. As can the seen, the graph of velocity vs. powder weight of the 10mm is "higher" than that of the 400 Corbon. This implies that the 10mm chamber pressure is higher at any particular powder weight. The obvious reason for the difference in chamber pressures, is that the 400 Corbon case has a larger usable capacity than the 10mm case. The 400 Corbon case is shorter, but both cases have roughly the same capacity. This means that when one builds the two rounds to the same OAL, the bullet is seated further out in the case of the 400 Corbon round. Consequently, the usable capacity is larger. There are two other potential reasons for the difference in chamber pressures. I used two different bullet types; a Hornady XTP/HP in one case and a Speer GoldDot in the other. The two bullet types, though of the same weight, could result in slightly different chamber pressures. The higher case capacity of the 400 Corbon case may be accounting for the lower chamber pressure. This also implies that the 400 Corbon load has more "head room". The next experiment to try will be built the two progressive sequences using identical bullets. But the results are promising and point to the 400 Corbon being capable of higher safe velocities with the same bullet. Please don't describe the 400 Corbon as "defunct." It is not dead, it is "uncommon." Let's not start a self-fulfilling prophesy. Please ck out the Wikipedia page on the 400 Corbon. I spent *hours* today expanding it. As you can see by the number of barrel makers offering conversion barrels, it is far from dead. I even included links to a couple of your webpages. Feel free to contribute! Very good job on working up that 180gr load. Also to "anonymous", I have read your wikipedia entry this weekend. I think I might have been the first one to see the new update from the old single paragraph they had before you expanded it. I have been interested in 400 Corbon for a long time and now I have the informatin necessary to get started on my own project. anonymous: it's defunct because no ammo manufacturer makes it. Not even Corbon, the inventor of the round, has it on its list of regular offerings. I'm the guy who overhauled the Wiki on the .400. The round is neither defunct nor a wildcat. Corbon offers it in *7* different loadings (acc to their 2008 catalog and I double checked 4 of them in their online store, which lists them as in stock). Acc to their .pdf cat. : 155 gr DPX (page 4); 135 gr Pow'RBall (p. 7); 115 Glaser Blue (p. 9); 135, 150, and 165 gr High Velocity JHPs (p. 11); and 165 gr FMJ (p. 14). So, unless you're operating off of more up to date info, you are mistaken. I can't call their number to verify because it's almost 10pm on a Friday night. Hope this explains my position. 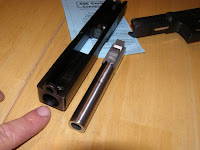 BTW you can do me a favor by adding a photo of a .400 cartridge to the Wiki page. Ideally would be a picture of (from L to R): 9mm, 357SIG, .40S&W, 10mm, .400 corbon, and .45ACP. That would put the 400 in context of its competition. I just realized I should've put the link to the Wikipedia page. It's now #1 when you search ".400 Corbon" w/either Yahoo or Google and when you search just plain "Corbon" it's #3 on Yahoo and #5 on Google. CheaperThanDirt.com also sells Corbon ammo for the .400. It's me again -- the guy who overhauled the .400 Corbon Wiki page. Looks like the website that had your article, "180gr on 400 Corbon and 10mm, “Take Two”" is now permanently off-line. Could you post that info somewhere else so I can continue to link to it? If you do, please post info re its new location on this webpage so I can easily find it and update the Wiki link. I ck this page every few weeks. 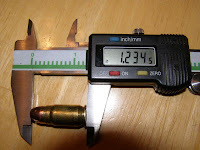 That info is important for people who are thinking about using the .400 for hunting or metallic silhouette shooting. "Long live the .400 Corbon!" Also live in California and could not get high quality 10 mm. Bill Jarvis make a .400 Cor Bon barrel for my Ed Brown that is more accurate than the one Ed made. Great job on the Wiki page - great source of info.